I wear this watch everyday. It has great style that can be worn casually or formally. The fit is great. I did get 2-3 links taken out by my local jeweler and I have large wrists. Dimensions Case: diameter 66mm thickness 14mm. Bracelet: width 28mm. My boyfriend saw this watch at the mall, for a much higher price; and instantly fell in love with it. I decided to browse online to see if I could find it, and here it was. He's a big guy and, putting it lightly, this is a BIG watch. It's perfect! :) Cain't wait to see the surprise on his face on Christmas day. So glad I found it, and at huge savings. There's so much functionality with the dual time zones, and it's waterproof. What a great piece. The watch is awesome. It has multiple clocks and functions as a global economy time-money tracker. I appreciate the third-party female attention is draws. They instantly grab my wrist to take a closer look and see that it's Diesel, like me! 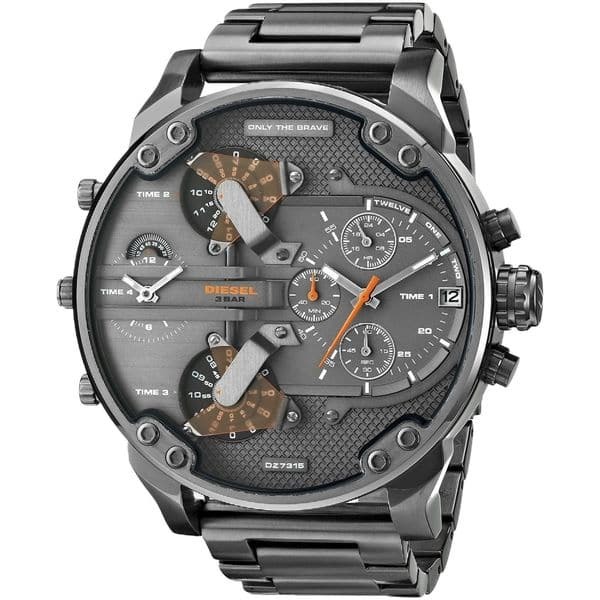 It is an awesome watch! Always get compliments! I like it. It is original. My boyfriend saw it at the mall, and absolutely fell in love it. I found it on Overstock.com for much less. This will make the perfect Christmas gift for him!